New version of popular email notification software for Hotmail, POP3 accounts. Your favourite speaking animated character reads aloud incoming emails. Features antispam filtering, simultaneous account checking. Lets you listen to your emails, web pages, documents, help files or anything else you copy to the clipboard. 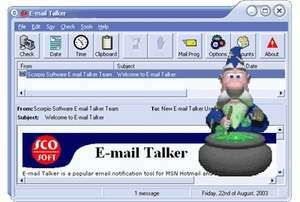 E-mail Talker 4.0 is a shareware program and can be used as a demo to try the software until the free trial period has ended. A full version of the program is available after the trial period ends. For security reasons, you should also check out the E-mail Talker download at LO4D.com which includes virus and malware tests. Additional screenshots of this application download may be available, too. Programs in this category generally deal with programs which are designed to send a mass amount of email out to various recipients at once. Check out some of the freeware downloads available in the mass email software category. They contain no strings and are available at zero cost.